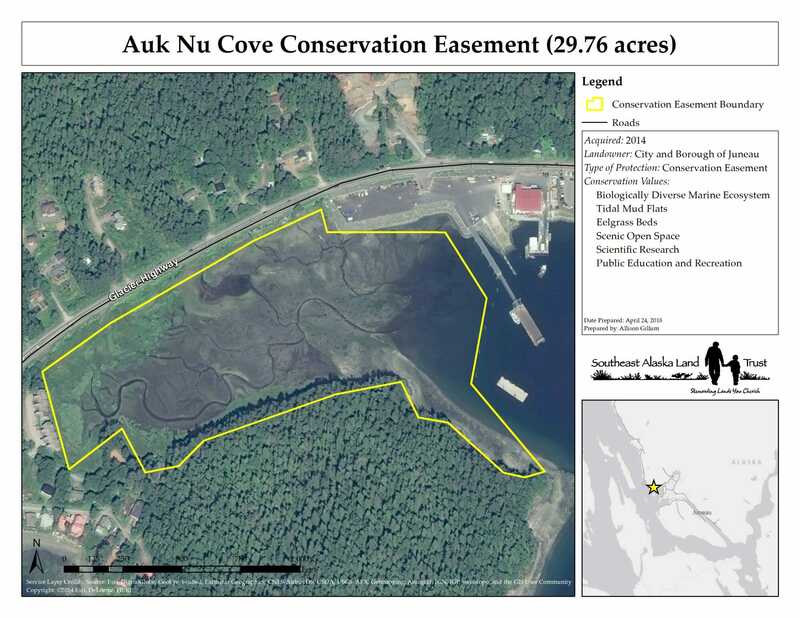 In 2014, Auk Nu Cove was given to the City and Borough of Juneau by the State of Alaska, whereupon the City executed a Conservation Easement with the Southeast Alaska Land Trust. This was a mitigation project for the Docks and Harbors Auke Bay Loading Facility. Auk Nu Cove is an estuary, mudflats, and intertidal area that support a diverse plant community including microscopic benthic microalgae, microalgae, and nearly 5 acres of vital eelgrass beds, a special habitat classification under the Clean Water Act. These underwater grasses provide erosion control, oxygen production, nutrient recycling, and contaminant filtration. Eelgrass provide important spawning habitat for herring and rearing habitat for many commercial and forage fish species. NOAA researchers have tracked a 61% loss of eelgrass on the property from the 2008-2011 period compared with the 2004-2007 period. Turbidity and sedimentation from nearby vessel traffic are likely causes. Eelgrass is the most widely distributed seagrass in Alaska but it comprises only 3% of Juneau’s shoreline. Auk Nu is a Tlingit name meaning “Auk fort.” Auk Nu Cove is adjacent to Auk Cape, also known as Indian Cove or Indian Point, which is a historic Tlingit Áuk’w Kwáan tribal use site. The Áuk’w Kwáan conceive of the entire Auk Cape as one property X’unáxi Tlingit, referring to its earliest use as a stopover and camping place and encompasses offshore islands and nearshore areas of Auk Nu Cove. Auk Cape is significant for four main reasons. First, the Indian Cove side of the Cape was the “original habitation site of the Áak’w Kwáan in the Juneau area”. Second, Auk Cape was an excellent fishing site for the Áak’w Kwáan before the decline of the herring run in Lynn Canal. Third, the Cape and nearshore islands are the sites of shaman graves, which extend a particular power beyond the actual gravesite and are generally avoided out of respect. Finally, Auk Cape is a historic lookout, refuge site, and meeting place for major events in Áak’w Kwáan history, including battles and encounters with other groups. Indian Point was added to the National Register of Historic Places in 2016.